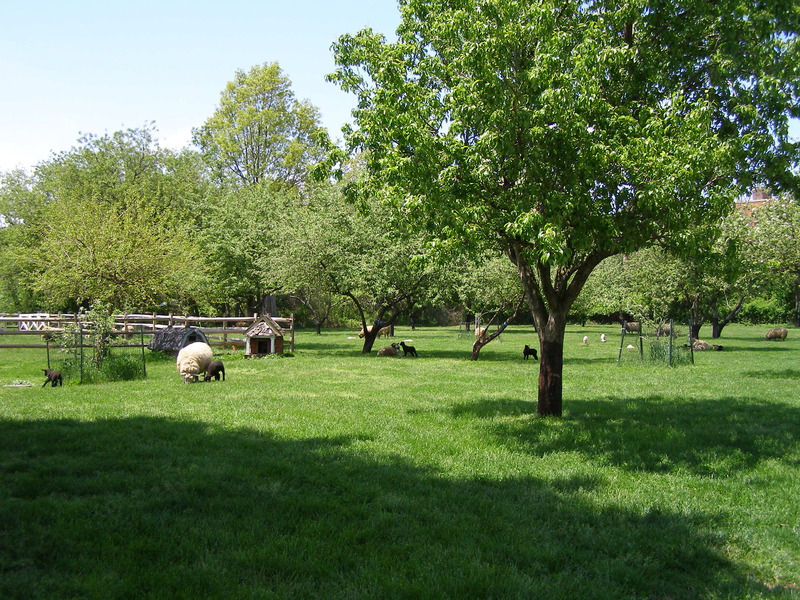 Sheep graze in orchard of 47-acre Queens County Farm Museum in Floral Park, Queens. It was mid-August, just weeks before the peak tomato harvesting season, when I visited Michael Grady Robertson last year at the Queens County Farm Museum, a 47-acre working historical farm in Floral Park, Queens. Robertson was bracing for a bumper crop. He expected to harvest more than 1,000 pounds of tomatoes a week. Dressed in a snug T-shirt and jeans, his hair cropped tight, he almost passed for James Dean. He strode along the penthouse-size pens of pigs, goats and sheep, reflecting on the goals he sought to achieve as the farm’s recently hired full-time supervisor. Aside from increasing agricultural production, he wanted to implement the highest standards of organic farming practices for fields and livestock and create an environment where animals could be “happiest and healthiest in.” In addition, he wanted to become a long-term resource for people who wanted to transition into farming from city jobs. “I want to be here years and years and years,” said the Kansas City native, a resident of Green Point, Brooklyn. For Robertson, 33, a philosophy major from Boston University, the position at the Queens County Farm Museum was the culmination of a string of volunteer jobs and apprenticeships on farms in the U.S. and abroad, including a nine-month “labor of love” in a rural community in Guatemala. “It’s by far the most rewarding,” said Robertson of his job as farm supervisor. Robertson followed the path that many recent college grads are taking to explore their vocation for farming. Many are working as summer interns or apprentices on farms, some even dropping out of school to work as farmhands. According to the Northeast Small Farm Institute, a non-profit that runs an apprenticeship and other programs for aspiring farmers, the number of young adults applying for farm apprenticeships is on the rise. Last year, 60 people applied to the institute’s NEWOOF apprenticeship program, up from 36 the previous year. To Robertson’s deep satisfaction, the farm is quickly becoming a “go to” place for urbanites who want to learn about organic farming or think they might want to farm. Robertson reports that people — restaurateurs especially — often approach him for opportunities to work or volunteer on the farm to “see what it takes” — physically, intellectually, financially, and emotionally — to be a farmer. As farm production expands, Robertson hopes to have a small seasonal apprentice-like program. “I would like to expand to the point where I need three, four, five dedicated people who want to do this with their life,” he said. Competition for choice farm apprenticeships is as fierce as the battle to be the next Apprentice or American Idol. McIlwaine lined up several farming gigs through Willing Workers on Organic Farms – WOOF – an international organization that gives participants room and board on organic farms in exchange for their help. After “woofing” for a while, she worked on farms in Vermont, California, Spain and Argentina. Her experiences helped her confirm her life’s calling. “I can’t imagine doing anything else,” she said of farming. Neither can Robertson. When I left him that mid-August day, he was planning ahead, thinking way beyond the upcoming tomato season. He stood in a field of mixed crops, – the “night shades” – tomatoes, peppers and eggplants – plucking hot peppers into a white bucket. The peppers fell in one by one under a gentle noonday sun. Entry filed under: City Farmers, Local Food Production, Urban Agriculture. Tags: eggplant, farm apprentices, farm internships, hot peppers, Michael Grady Robertson, night shades, Northeast Small Farm Institute, Queens County Farm Museum, tomatoes, urban farm, urban farmers, Willing Workers on Organic Farms, WOOF, young farmers.